One shining hope has emerged from three catastrophic months of war. 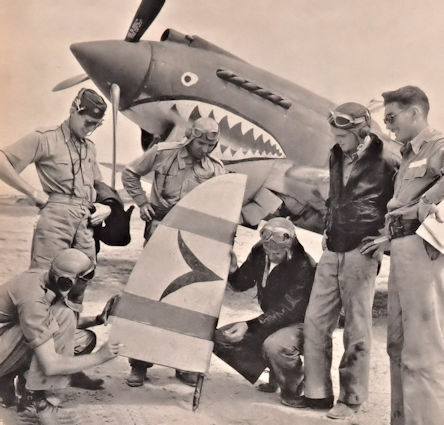 That is the American Volunteer Group of fighter pilots, the so-called "Flying Tigers" of Burma and southeast China who paint the jaws of a shark on their Curtiss P40's. Outnumbered often ten to one, they have so far shot down about 300 Jap planes, killed perhaps 800 Jap airmen. They have violently wrenched from the Jap Air Force control of the skies over Burma and southeast China. They have conclusively proved what was once only a Yankee belief: that one American flier is equal to two or three daps. "Give me," said U.S. Lieutenant General Brett in Australia last week, "100 fighters to 200 Japs and I'll lick them every time. And I am not disparaging the Japs. They are good fighters." 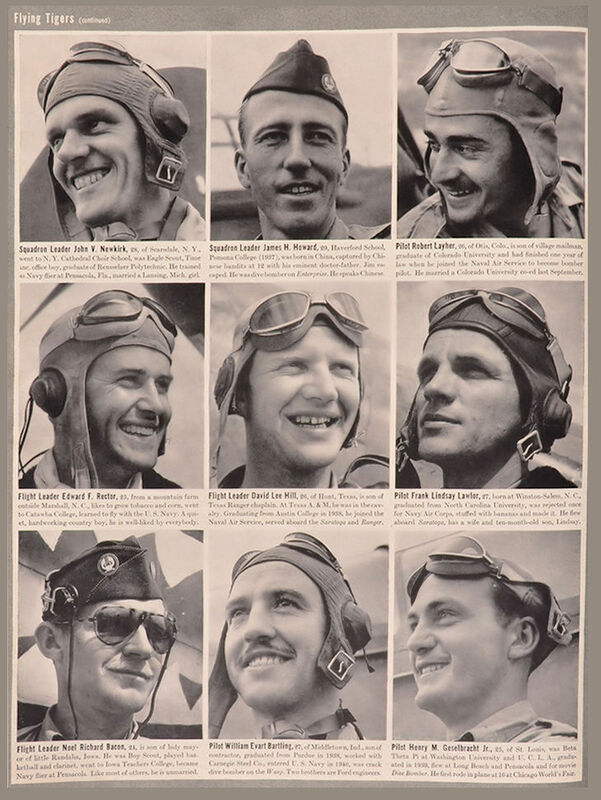 On the following pages LIFE presents the first full-length portrait of the Flying Tigers in action, taken by LIFE Photographer George Rodger before Jap ground forces seized the A.V.G. base al Rangoon. 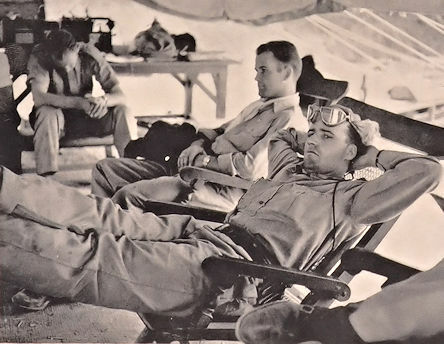 The hundred or so young men of the Flying Tigers have several tremendous assets: 1) they have had up to six years of military flying and they have an instinctive feel for what their machines will do; 2) they have been blooded in the air and 3) they are always looking for a fight. The result was bound to he something extremely painful to anybody who ran into them. On their first meeting. they aetually lost four planes to the Japs' six. On the second historic meeting, on Christmas Day, they moved down 20 out of 78 Japs with a loss of zero. The holocaust was on. 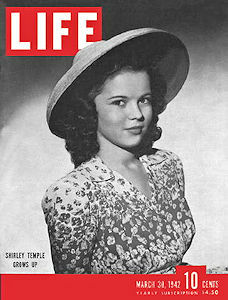 Webmaster's Note: The term, "Jap," is clearly derogatory but in the context of the times, Life Magazine and American lexicon used it freely. I have included the article and captions exactly as written for historical accuracy. The American Volunteer Group was recruited from U. S. Army, Navy and Marine fliers a year ago, under hush-hush circumstances to avoid offending the Japs. Its job was to help China fight. Pay was $600 a month with a $500 bonus for every Jap plane shut down. The men, who had been promised no loss of rank in the U. S. Armed Forces, began nrrisiug in the Far East last summer, registered as tourists, acrobats. artists. They were trained and organized by China's crack American Air Chief,Colonel Claire Cheunault. When war broke out Dec. 7, they were just about set. 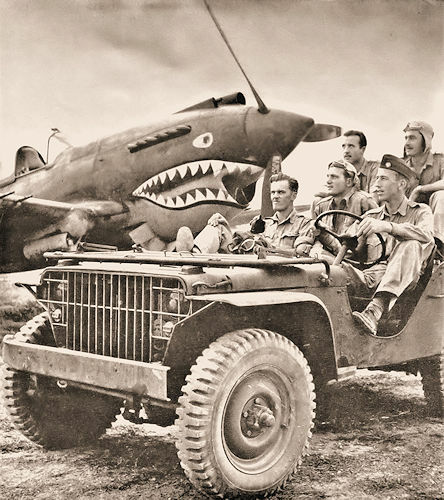 Five Flying Tigers pose in jeep car on the flying field. Front seat, from left: Newkirk, Geselbracht, Howard; in back: Bartling and Layer. 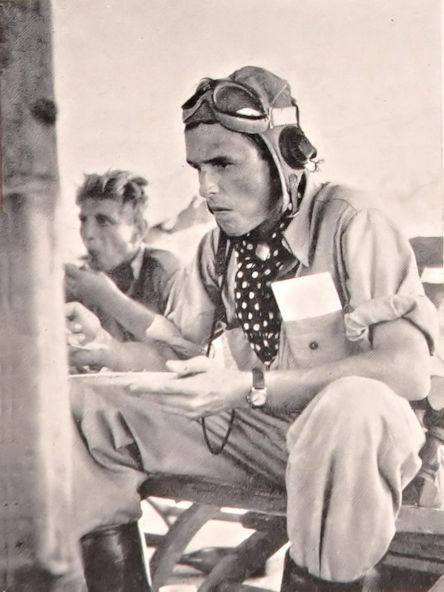 Newkirk, the man making a face, has shot down 25 Japs so far, had seven or eight when the picture was taken at the end of January. Newkirk and Howard are squadron leaders. Other three are later arrivals. 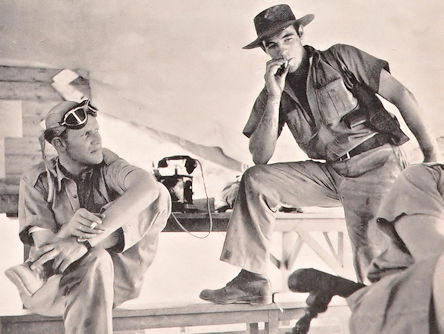 After the fight, Pilot Hill (left) talks it over with his armorer, Jim Musick, by the telephone in the pilot tent. There were three raids this day, Jan. 23 . In first Jap attack of 30 planes, 16 were shot down. Even in China, the AVG boys get American steak, ham and eggs, pie, hot and cold running water, see very ancient movies. American movies. Most wear shoulder holsters. Jap rudder from plane shot down near the field is exhibited by (from left) Pilots Hill, Bacon, Cole, Rector, Lawlor and Schiel. Pilots on duty wair for call in pilot tent on edge of field. In forground is Tom Cole of Missouri who was killed soon after. He had parachuted but Japs machine-gunned him in the air. One of his friends promised, "Those yellow so-and-so's had better write themselves off all the way down now." Mad clear through is Pilot Matthew Kuykendall, 23, of San Saba, Texas. 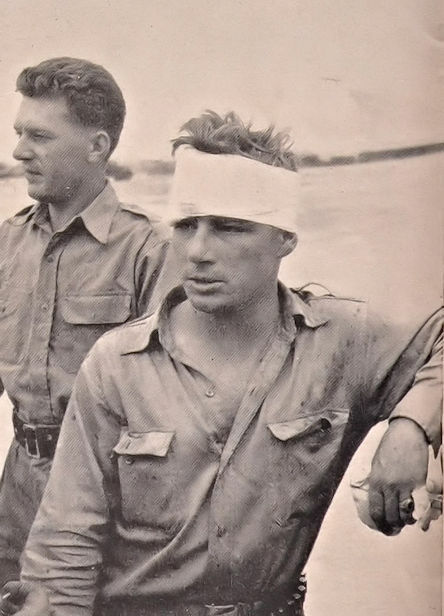 He was hit in forehead and finger by Jap fire. He owns Hereford herd in Texas, is a fine horseman, roper, rifle shot, rancher. 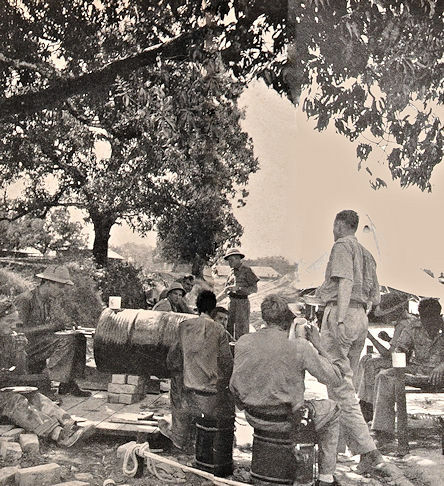 Under a mango tree, Flying Tiger pilots and crews have lunch of corned beef, vegetables, bread, bananas and coffee. In the background is the tent for pilots on active duty. Word of oncoming Japs comes here by telephone. A few minutes later word came and the boys went up. They got all of a seven-plane Jap bomber squadron. Lawlor got four, Barling two. One American plane was lost. Ready for action after a quick meal is John G. Bright of Reading, PA. He went to Exeter, was Princiton pol vaulter. Son of a hardware manufacturer, he "always wanted adventurous job." These great American air fighters do not talk ideologies, though they are all educated men. They do not discuss why they are fighting. They are having a good time and a highly dangerous one, but Dave Hill wants to be a rancher, Layer wants to practice law and Ed Rector wants to grow tobacco in the hills. In effect, the Japs interfere with those programs and must be eliminated.